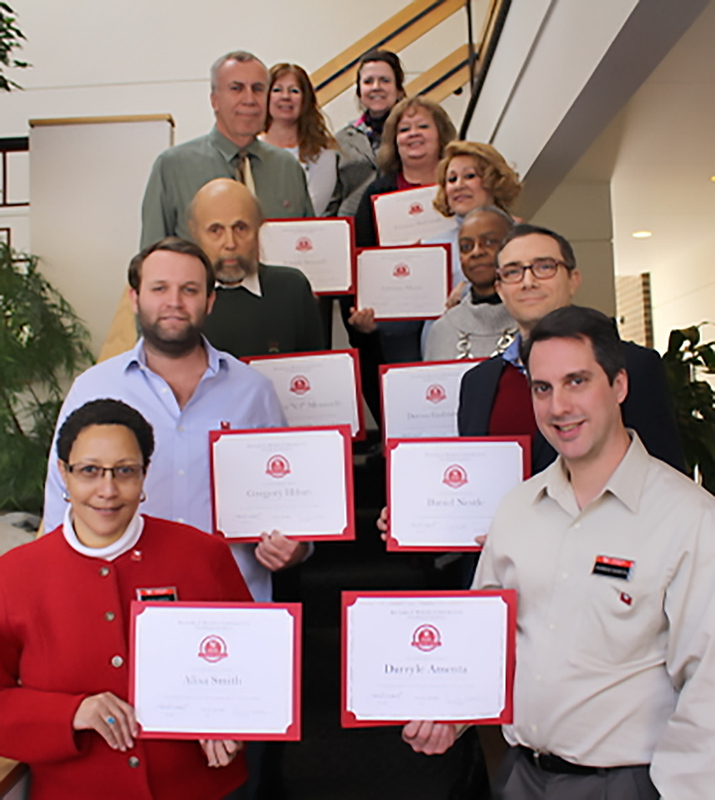 Pennington, NJ – February 2, 2016 – Weidel Real Estate, a leading independent real estate agency in New Jersey and Pennsylvania, is pleased to congratulate the new sales associates who successfully completed Weidel’s comprehensive Master’s Academy Program. This intensive hands-on workshop provides new agents with the fundamentals of real estate over a 2-week period, which includes real estate sales, contracts and law, ethics, financing and title insurance, and Weidel’s unique “Five Star” Seller’s Marketing Program. The course offers specialized training by experienced real estate veterans to all new Weidel agents, whether recently licensed or joining from a previous real estate affiliation. The associates who completed this rigorous course and are now representing the Weidel family are Darryle Amenta, Florence Broadway, Gregory Hiban, Adriana Marin, Charles “CJ” Mozzochi, Daniel Nestle, Joseph Senneff, Alisa Smith, and Donna Zielinski. Daily workshops in the program cover personal marketing, prospecting, market value analysis, Buyer agency, Weidel Seller Services consultation, online marketing, personal websites and relocation. The Weidel associates also explored how mortgage and title insurance services can make the buying and selling process easier for the consumer, which was given by Weidel affiliates, Princeton Mortgage Corporation and Princeton Assurance Corporation. For more information on Weidel’s Master’s Academy or to discuss buying or selling a home, please contact us at 1-800-288-SOLD or visit www.weidel.com. Weidel Real Estate – Since 1915, the Weidel family of companies has been earning loyalty, trust and respect through an unwavering commitment to individualized, quality service. Our mortgage, insurance, title and national relocation entities allow us to offer our clients the benefits and exceptional value of a full service organization. Moreover, the dedication, enthusiasm and integrity of our Associates exemplify Weidel’s unique culture. For more information, please contact Weidel Realtors at 1-800-SOLD, or visit our website at www.weidel.com.